Google has unveiled a new version of its Google Wallet service that avoids the requirement for individual payment cards to be loaded onto a secure element. Instead, a prepaid MasterCard which draws funds from linked credit and debit cards is pre-loaded onto the secure element. Google has unveiled the long awaited version 2.0 of its Google Wallet service. Unlike version 1.0, which needed card issuers to become directly involved in provisioning their payments cards onto the wallet, Google Wallet 2.0 allows a single prepaid MasterCard to be stored on the secure element. When a user conducts a mobile payment, this prepaid card draws on a credit or debit card which the user has previously linked to the card account to fund the purchase. “Since we released the first version of Google Wallet, the app that makes your phone your wallet, we’ve made it available on six phones from Sprint and Virgin Mobile, as well as the new Nexus 7 tablet. We’ve also partnered with more than 25 national retailers, and thanks to MasterCard PayPass, you can pay with your phone at more than 200,000 retail locations across the US. “To save a card to Google Wallet, just enter the number into the mobile app, online wallet, or Google Play when making purchases. When you shop in-store, you can use Google Wallet in conjunction with your selected credit or debit card for purchases. Shortly after making a payment, you’ll see a transaction record on the phone with the merchant name and dollar amount. You can now view a history of all your in-store and online purchases from the online wallet. When you add credit or debit cards to the Google Wallet mobile app, you will be issued a virtual MasterCard card by The Bancorp Bank, Google Wallet’s partnering bank. This virtual MasterCard is referred to as the “Google Wallet Virtual Card” in the Terms of Service. When you activate your credit or debit cards in Google Wallet, they are linked to the virtual MasterCard card. When you make an in-store purchase, Google Wallet facilitates payment to the merchant for your in-store purchase using the virtual MasterCard, then charges the amount of the original purchase to your selected debit or credit card. For these transactions, the merchant will not receive your credit or debit card credentials. 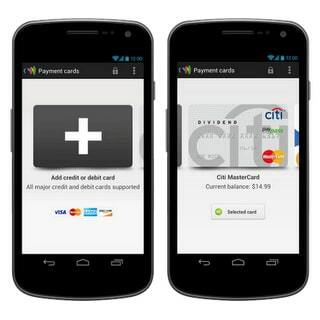 Rather, Google Wallet will presents the virtual MasterCard card to the merchant. Transactions with linked cards will appear on your bank statement as “Google *merchant name”. If prompted by the cashier, say that you’re “paying with credit” via MasterCard. You can find the last four digits of your virtual MasterCard account in the card details page of one of your linked cards. Some cards, such as the Google Prepaid Card and most Citibank MasterCard cards, are directly enabled by the issuing bank for use with Google Wallet and are not linked to the virtual MasterCard account. When you use the Google Wallet mobile app for an in-store purchase, your card details are presented directly to the merchant. The merchant will receive your registered card information, and will process the transaction as if you had presented the physical credit or debit card for payment. Google has also added the ability for users to easily disable their mobile wallet if it’s lost. “If you lose your phone, just visit the ‘Devices’ section in the online wallet and select the phone with the mobile wallet you wish to disable,” Dua explains. “When you successfully disable your wallet on a device, Google Wallet will not authorize any transactions attempted with that device. For now, Google Prepaid Cards and some Citi MasterCard cards will remain active until Google Wallet can remotely connect and reset your mobile wallet, however, Dua adds. The new Google Wallet app is available now on Google Play for consumers in the US. “We think this new option will increase the appeal of the Google Wallet – by making it more convenient for consumers with any card issued by any US bank to enjoy the speed and convenience of PayPass Tap & Go payments from their NFC-enabled Android phone,” says MasterCard’s Mung Ki Woo. “We expect to see a lot of new customers signing up for the program, linking a card – and tapping at PayPass terminals across the US”. Looks v cool. when is it coming to australia? +1 seeing that google sells the nexus phone and 7 outright via google play you would think it would be smart for them to launch in australia but i guess time will tell, i think they are focussed on the US market for a while to come. interesting, wonder what will it mean for offline transactions? Offline transactions and empty battery ?